Arrived in Mumbai yesterday evening just in time to experience rush hour traffic. The trip into town, that I’m guessing should take about 45 minutes, took well over two hours. LA traffic jams are nothing in comparison to Mumbai’s. This morning, however, the traffic wasn’t bad on the way to the Gateway of India to catch the ferry for Elephanta Island and the last set of Hindu/Brahmanical caves I will see on this trip. The ferries go every ten minutes so there wasn’t any problem getting on and the approximately hour crossing was delightful with a slight breeze to offset the hot sun. It was quite hazy so, unfortunately, the pictures didn’t come out as well as I’d hoped they might. The large Gateway of India was the point of departure for the last British ships to leave after the end of their colonial reign, so it is fairly richly endowed with the history of the country. Now, however, it is a gathering area for tourists, domestic and foreign, as well as being next to a shipyard and marina. The waterways between the mainland and Elephanta are busy with heavy working ships, some of which may be for off-shore drilling; at least that’s what it looked like to me. To dock, the ferries line up next to each other so that the passengers climb from one ferry to another to reach land. Once there, there is a mini-train for RS 10 that will take those who need it to the bottom of the steps leading up to the caves. It is, however, far easier and quicker to walk the distance than wait for the train. The guidebook and website led me to believe that there was a very long staircase up to the caves, but that just isn’t so. It is about a four maybe five story incline, but that’s about it. The path up is lined with vendors, who while pushing their wares, were not nearly as offensive as those in Ajanta. Their stalls are neat and the offer the typical kitch, but also some nicer pieces in marble. (Marble shops line the street from the domestic airport into town, so it may be a local commodity.) The first and main cave is at the top of the stairs. This is really the only one that still has remarkable sculptures and reliefs. The other four in the Hindu section on Cannon Hill, (named for the old Portuguese cannon that is still there) are unfinished, looted or only have a lingum with entranceway of interest. The main cave, however, definitely makes the trip worthwhile. The guidebook and websites mention two additional Buddhist caves on the adjoining hill, but the path to them was blocked off. It appears those caves are not in structurally sound condition and the authorities don’t want any more people traipsing through them. 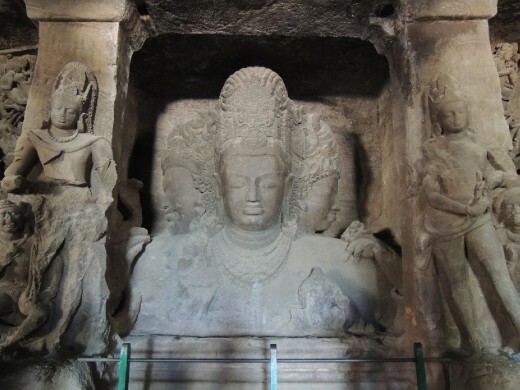 The Archeological Survey of India dates the Hindu caves to the 5th – 6th C CE, which makes them contemporaneous with the Buddhist Caves at Ajanta, and with the latter part of the early period of the Chinese Longmen Caves. They share the desire to carve very large figures that have a powerful almost Michelangeloesque feel to them although the hands and feet are considerably more graceful and refined than those portrayed in Italian Renaissance master’s work. The site is dedicated to Shiva. The main hall has a number of large wall sections with sculptures and reliefs in varying degrees of damage. All of the sections have pieces missing, arms and legs hacked off at some unknown period in the past, but for the most part it is still possible to get a sense of what they looked like when they were constructed before they were painted. As the paint has entirely faded, there is no way to know what the actual finished product looked like. The central image of the main temple is a three-faced Shiva, who is locally called the Trimurti, which is actually an incorrect use of the term, but oh well. I don’t think the god minds; either way it is a symbol of the oneness of God and the universe and he takes on the roles of his brother gods within the image. His right face is that of Rudra, the Destroyer and sports a mustache and a fierce look, his left face is that of the Maintainer/Preserver, a task is normally assigned to Vishnu. In this piece, Shiva’s ears seem to have a conch-like ornament, a symbol that is also aligned with Vishnu. Shiva in his creator role is facing forward. This is Shiva as Brahma and his visage exudes peace and calm. His headdress is quite ornate with jewels carved into it. I also find it interesting that he has long ears, which are a trait of the Buddhas and his serene visage looks Buddha-like. In addition to the magnificent central piece, there are a couple of statue sets with Shiva and Parvati, one with Ravana trying to lift Mt. Kailash, another of Shiva killing the demon, of him as Nataraja dancing, one with Mata Ganga letting her water flow threw his dreadlocks, and a very nice one of Shiva in his Ardhanarishwara form - where his right side is male and is leaning towards Nandi, his bull vehicle, and the left side is Parvati/female and one of her left hands holds a cobra. In the back and off to one side is a panel of Matrikas. There are also three separate Shiva Linga rooms within the main hall or in the nearby caves. The last cave has what looks like a newly erected lingum in an unfinished space. As at most of the sacred temples and shrines in India and Nepal, monkeys are everywhere. I normally do not carry anything in my hands other than my camera because they are known to grab whatever you have, but today was hot so I bought a lemonade from one of the vendors. I was drinking it on my way back down the steps when a skinny tawny screaming teeth-baring primate started to attack. It was clear he wanted my soda bottle. I really didn’t want to suffer a diseased monkey bite, so I threw it to him. He grabbed it, stopped screeching, and happily jumped up onto a banyan tree vine to meet his compatriots. I’m sure my plastic will now contribute to the mass of trash on the island, but who’s to say that it wouldn’t anyway as I have no idea where the workers dump the trashbins. Recycling happens here by reuse, not by morphing the product into another. I recently heard about a project in Norway that is using trash as a means to create fertilizers and wealth. If India could use Norway’s concept, they would be by far the richest country in the world. After returning to the mainland, I visited the MumbaDevi temple. She is the goddess for whom the city is named. The temple is fairly small, but there are two images of her, one in white, which is the central image and the priest was officiating at her feet when I was there and a second off to the right that has a red face. Both are elaborately clothed and draped with fresh orange marigold garlands. The faithful offered prasad, cloth, coconuts and trinkets to the goddess for blessings. Photography wasn’t allowed, so unfortunately I don’t have any photos to share of her. Her temple is near the Zavari Jewelry Bazaar, which I walked through but wasn’t impressed with the things for sale or with the bazaar itself, so I took a cab to the Chor Bazaar, which is known as the “Thieves Bazaar” and is quite famous. The place was interesting from a cultural perspective, but not somewhere I would return to. On my walk back towards the Fort area of town, I came across a fairly large and ornate Shiva temple in the middle of the street. I looked up to the flag at the top of the temple and was amazed to see two golden eagles just sitting there. In the middle of the hustle and bustle of millions of people screaming and cars honking there were two mighty birds of prey calmly surveying the madness below. It could only happen in this incredible land of contrasts.